But that was in ancient times: aren’t we different? Christ said His body was the new Temple (Jn 2:19-21) and St Paul that our bodies are to be chapels (1Cor 6:19-20) . In our epistle we are described as living stones of a building of which Jesus is the foundation stone (1Pet 2:4-9; cf. 1Cor 3:9-17). And in the Gospel, Jesus dismisses squabbles over whether the Jewish holy places or the Samaritan ones are best, saying true worshippers worship the Father anywhere “in spirit and in truth” (Jn 4:19-20). So haven’t we Christians outgrown the primitive need for sacred sites, sacrificial rocks and ritual offerings? Why do we still take church buildings so seriously? Well, one reason might be because Jesus took them so seriously. Crucial moments in Jesus’ life took place against the backdrop of the Temple: His Presentation as a baby, His Finding as an adolescent, His praying, preaching, debating and healing as an adult. He cleansed the Temple of bankers in Holy Week, offered His Last Supper to coincide with the Paschal sacrifice in the Temple, and though innocent was tried and convicted by the Sanhedrin in the Temple precinct. Jesus, as His apostles observed, was on fire for this place, like incense on a brazier (Jn 2:17), determined it should be His Father’s house. What is it makes a church the Father’s house? Is it strange furnishings, hierarchical layout, spooky atmosphere? The mood of portentous theatricality created by sheer bigness, the heaven-reaching spires and earth enveloping domes, the statues and stained glass, marble, brass and the rest? No: important though aesthetics are, what makes a church a holy place is the liturgical act of dedication and the ritual acts that happen thereafter or, in this rather unusual case, for 130 years already before, as well as for many years after. So a church is not so much a building as a space, withdrawn from ordinary work and play and dedicated to God. When Jesus drove the money-changers out of the Temple, He was not making a statement against capitalism, banking or making a living. Rather, He was saying this place is not for that use. So today, after a rather long catechumenate of 130 years, we’ll witness a pagan girl, named Ecclesia, completing her initiation as a Christian. At the start of Mass I baptised her, as it were, sprinkling the walls and altar with baptismal water in recollection of Cardinal Moran blessing the first section all those years ago. Now, she is instructed through a ‘mystagogia’ of readings and preaching: are you listening altar, paying attention walls? A space is dedicated today, an altar consecrated, for a sacred purpose. Church-altar-Christian, all are remade in Christ. He is our true church and altar, and so this place speaks of Him. Stone and fire, oil and incense recall ancient sacrifices that foreshadowed Christ. But today we initiate our church and altar with water and sacred chrism as only Christians are initiated; we trace crosses in the middle and all four corners of the altar to recall the crucifixion by which all ancient rites are superseded. Of course, the People of God are more truly the Church than are the chapels they build; the community of Kogarah far more than the building. God built his Church on Jesus, and Jesus on Peter, not on a concrete slab. St. Patrick, this church’s patron, travelled ceaselessly around the emerald isle preaching the Gospel so that by 461AD he had completed, almost single-handedly, the conversion of a nation. The Irish, in turn, sent missionaries to the world for centuries to come, so that eventually there’d be a St Patrick’s as far away as in Kogarah Australia. As I complete my visitation of this parish I notice that there is much good happening here, including leadership and teaching, worship and devotions, ministries and groups, that would make Cardinal Moran proud. But we are also aware that only about 1 in 8 Catholics is at Mass here on a Sunday. 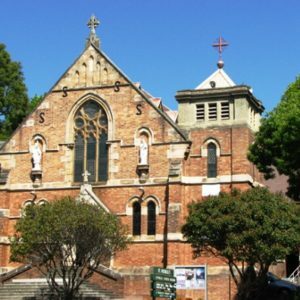 The Church today needs new St. Patricks and Patricias for our time, bringing the Gospel to this new Ireland of Kogarah and district. And it needs us all to think how we, as living stones of the Church of Christ, welcome and support each other as Christians and open our arms wide to the world. As you witness today’s consecration let yourselves be reconsecrated too. Hear the words and soak up the ritual. Let Ecclesia’s Baptism, Confirmation and Communion Day be yours too. As you are immersed in these rites of initiation, recommit to your own. As you witness natural materials made into a supernatural church, let God renew you as a temple of the Holy Spirit. May these sacred rites instruct our minds and hearts and senses, for we too are dedicated for divine service, that our very lives may be liturgies too! Welcome to St Patrick’s for this Solemn Mass. While the Second Sunday of Lent has shifted St Patrick’s Day to tomorrow in this year’s liturgical calendar, we will consecrate this 130 year old church on the real St Patrick’s Day. In 1887 my predecessor, Patrick Cardinal Moran laid the foundation stone at a ceremony attended by several hundred people. Where his English predecessors had dedicated churches around Sydney to St Mary the Virgin, St Benedict, the Venerable Bede, St Augustine of Canterbury and St Thomas a’Becket, this first Irish prelate preferred dedications such as St Fiacre, St Columba, St Columbkille, St Brigid, St Finbar and, of course, St Patrick, the Apostle of Ireland, to whom he dedicated the church in Kogarah. The first stage having been completed in less than a year, he returned in 1888, with the St Mary’s Cathedral Choir in tow, to bless and open it. The second half of the church had to wait until the end of World War One to be finished, and the bell tower until after the Great Depression. There’ve been further improvements as recently as this past year, renewing the building, beautifying and making permanent the altar and ambo, introducing the sound and video system, and the rest. Because this church took 130 years to build and pay off, each stage was blessed but the whole never consecrated – until today, that is. This week I’ve had the pleasure of meeting many involved in leadership and ministry in the parish or served by them. I’ve been treated to several Masses, visits to church, school and nursing home, and met many of you as apart of my canonical visitation of the Parish. In due course I’ll send your report card! But let me thank Monsignor Henryk and all of you for the warm welcome I’ve received and commend you on all the good you are doing. We gather conscious of darkness around our church and our world at this time. We pray today for all victims of child sexual abuse, for truth and justice in the matter of Cardinal Pell, for the victims of the terrorist attacks in Christchurch New Zealand, and for our grieving Muslim neighbours. But the consecration of our church is a tribute to our commitment to be here for God and our community over the long haul. The ceremony is one of the most ancient and beautiful of the Catholic Church – one few Catholics ever get to see. 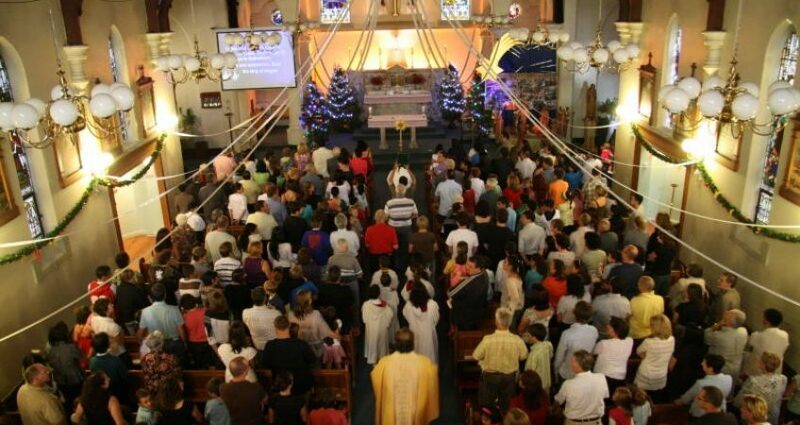 Like the stages of initiation of a new Christian, you’ll witness the ‘Baptism’ of the church and altar with holy water, being preached to from the new ambo, ‘Confirmation’ with sacred Chrism, the altar being dressed in white and given a fiery candle, and the celebration of its ‘First Holy Communion’. So it is a chance for each of us to reflect on our own journey of faith as a Christian.